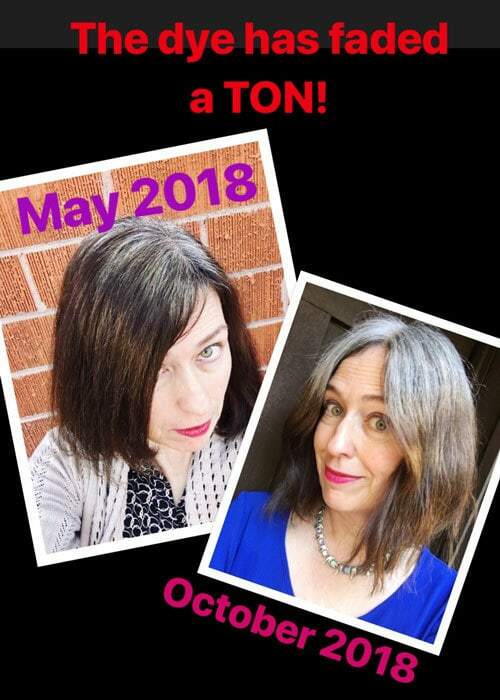 Yesterday was the 8th month of my gray hair transition, and I still feel 100% happy with my decision. It’s so damn liberating not to have to plan my life around getting my hair colored and hiding my roots! Woo-Ho!! I’m not sure how much of the fading was natural, and how much was due to the fact that I use a clarifying shampoo once a week. If I was doing this as a science experiment, I would have two women with the same color hair going gray at the same time, and I would take copious notes and graph results….but I have an art history degree and no background in science…so we’ll just forget about THAT idea! You can see that I have some of that dreaded BLORANGE in my October hair. Surprisingly, I took that picture the same day I used blue shampoo. I guess now that it’s getting oranger, it’s getting harder to tone that down? Have you experienced that? Darn! As my ends get lighter I will probably try Overtone again and see if that helps reduce the orange tone. 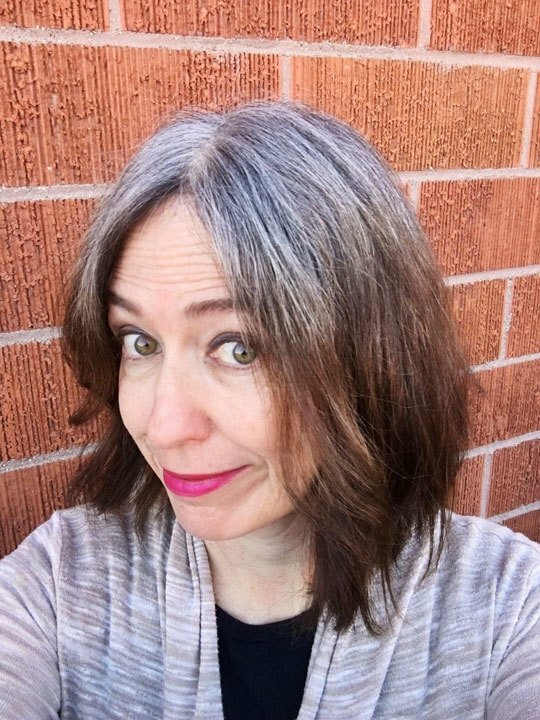 However, next time I use Overtone, I’m going to leave my roots alone – I prefer them white, and it gave them a bit of a blue tint. 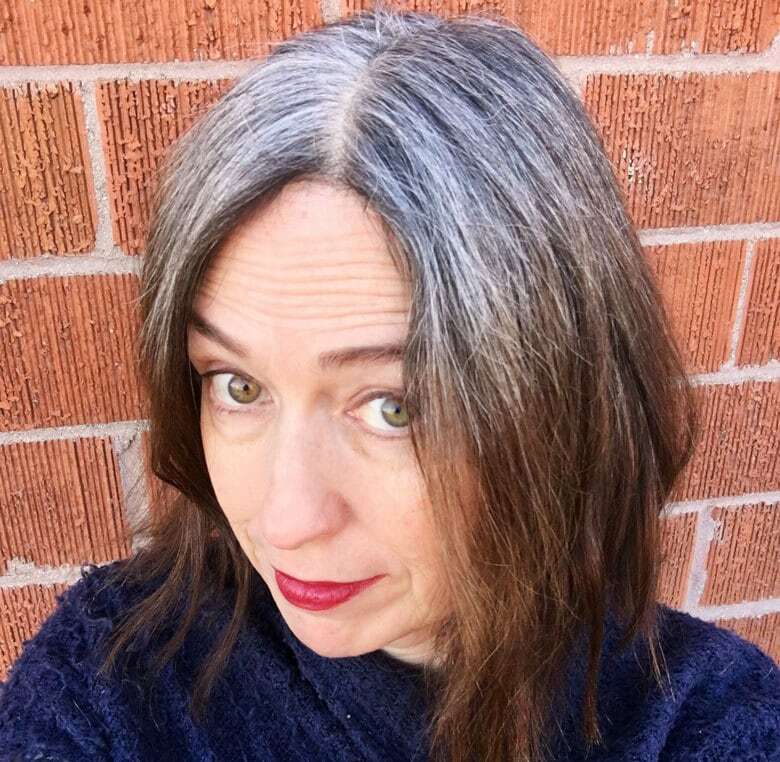 In Month 8, I’ve suddenly started having more flyaway gray hairs – not sure why? Maybe it’s the weather? 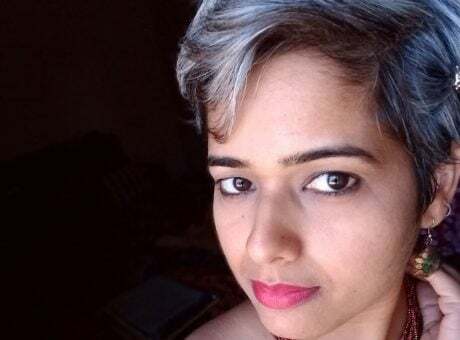 I’ve started using QuickSilverHair Oil to tame those. It also smells great, which is a nice bonus! Now that the silvers are really showing, I think it’s time to revamp my wardrobe a bit. As per my recent blog post about color, I’m going to try to add more pops of color to my wardrobe, and I hope you’ll join me. Remember to use the hashtag #kgpcolorpop on Instagram, so we can find each other and get inspired! I’m also going to check out Lauren from How Bourgeois’ new line of products. I can’t wait! As per a reader’s request, I’m going to research skincare. 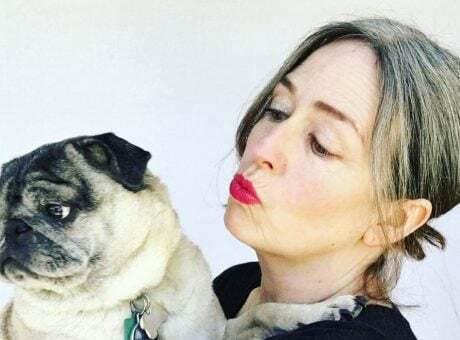 My skin was pretty much flawless for decades, and now – OMG! Dry skin, wrinkles, the works. I’d like to find out how to better address these problems and, if possible, find products that are natural and cruelty-free. Sleep – I have GOT to stop looking at my iPhone or laptop once I’m in bed. Do you do this? It’s very disruptive to your REM sleep, which is bad for your health. I try to break the habit, but it’s difficult. And I have no excuse, as I have a GREAT book I’m reading right now: A Voyage Long and Strange. It’s all about North America from the time the Vikings landed in Newfoundland to the Jamestown settlement. It’s so fascinating! Can I say once again how much darn fun I’m having? 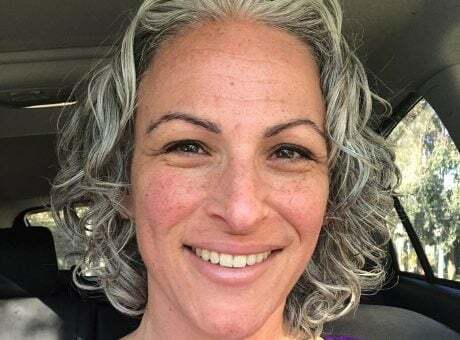 Who knew going gray would open up a whole new world?! 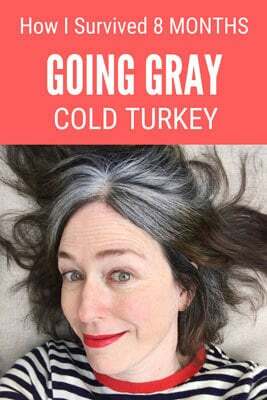 Thanks so much for being part of this and if you have any friends who are thinking about going gray (or are already gray), please share this blog with them. I’d love to spread the word. I am so impressed of the grow out process that you are going through! I knew I couldn’t do it so I chopped my longer hair off! With two short cuts I have all the old color gone and regrowing it back out. Today a stranger said “I love your hair!” I almost cried. LOL! Wouldn’t go back to coloring if you paid me. So liberating!! That’s wonderful, Tracy! So glad you are enjoying being fully silver! Great info Katie…I find it so interesting to see how much your dyed hair has faded. Mine hasn’t gotten there yet, may need to use the clarifying shampoo more often. I like that it’s not such a stark contrast to your silvers. Thanks for the tip on a good read, I too need to stop with blue light. Hey Katie and fellow Silvernators! Hi, Mel: I agree with you completely on the silver sparkles – so fun to see! I wish I’d realized sooner how pretty silver hair could be. And I’m so glad the transition stories are helping you! Regarding the iPhone, I do use Night Shift, but maybe I’m just oversensitive to the light? Good luck with your transition – it gets easier with every month, I swear!